The BIL got it stuck pretty good, tried for ages to get it out by himself, and then came home to get me and the other tractor to pull him out. Maybe we need a farming section on the forum as we don't seem to have one yet and post are made all over the place. Sydney and PeteGill like this. I am not sure how many farmers we have, but it is an interesting idea for a thread. How did you get in to farming in LOS? Had you farmed before, or were you one of those who has always fancied the lifestyle. Or third option marry in to it. I grew up on a poultry farm run by my late mother and I have always said that watching chickens being dispatched from an early age (both me and the chickens) helped form my rather strange sense of humour, that and the fact that my dad was a stone mason and I had visited just about every cemetery in the country by the time I was ten. But even from those days I can remember just how much hard work farming can be, especially when the weather turns bad. Did you have farming knowledge before you did this in Thailand? Last edited by Seven_; 14th August 2016 at 21:59. Looking at your pic seven, the front wheels of the kubota still look like they are on firm ground, was 4wd engaged? ..............also the pic looks like its on a side of a small hill, unsual to have wet ground. Q for 7, is AgLime used much in your area ... or which fertiliser is best suited to rice paddy? I know NPK is widely used to bolster growth and our own family use a lot of pig poo but interested to hear what you find best. MIL uses pig poo initially and NPK (15 15 15) later and gets highest yield/price for hom mali (jasmine) rice in their region. Mind you, she spends each day removing weeds and grasses and replanting any bare spots. Thanks for answering the lime Q and I understand now why never seen. [QUOTE=kaptainrob;238759]MIL uses pig poo initially and NPK (15 15 15) later and gets highest yield/price for hom mali (jasmine) rice in their region. Mind you, she spends each day removing weeds and grasses and replanting any bare spots. Interesting - and looking forward to more updates. Who do you sell rice to? Is it through the rice scheme? And what are the thoughts on the rice scheme up in Issan? These are the bees knees for temporary storage. Last edited by Seven_; 14th August 2016 at 22:00. Well very temporary storage, as they are not meant for storage over a period of time. 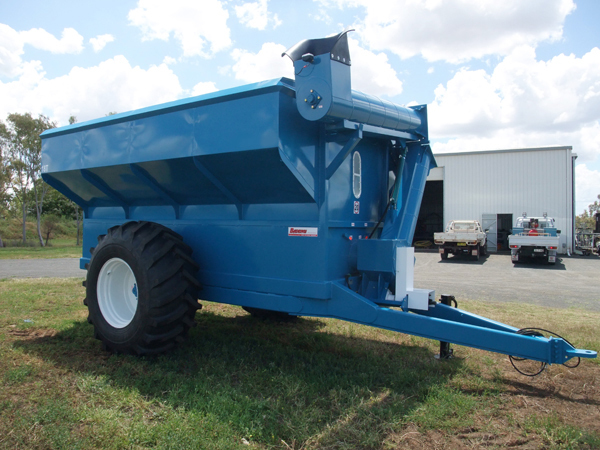 The are called field bins in Australia and are used to store grain while the harvester keeps cutting until the truck can get back to pick it up, without it the harvest when full would have to wait for the truck to get back before continuing. I don't think they would be of much use in Thailand, as they couldn't get access to most rice paddy's and would get bogged if they did. Also most of the time the rice is still wet after harvest and needs to be dried before storage. Also rice doesn't store well in silo's and you will have problems with moisture migration which results in hot spots and mold issues, which is why you don't see any around. so the harvest doesn't have to stop working, as most harvesters here have only small bins and seem to spend a lot of time stopping emptying into utes/trucks which are then un-loaded by hand, wasting a lot of time. I can understand the problems you explain with rice. We stored lupins and oats in mobile bins year round for feed. I did 70 bags that morning ... no whisky!